I have always love my mother's apple pie. No matter what other pies I taste, her apple pie is still my favorite. I got her recipe a few years ago and discovered that it's not just the pie filling that makes her pies so great; it's her crust too! 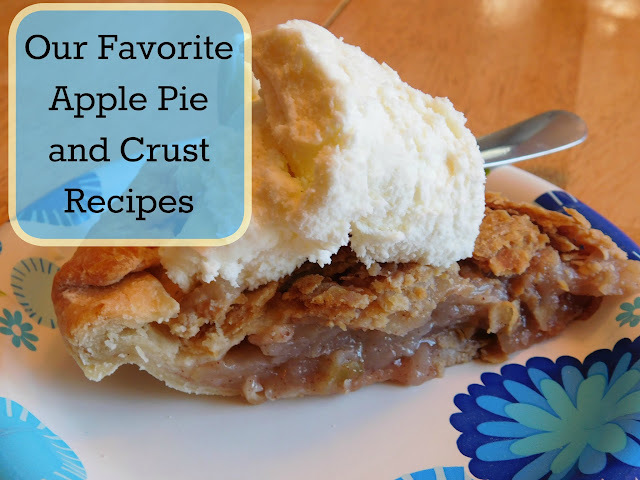 I have found this pie crust recipe to be so easy to mix up and so delicious for a variety of dishes. It makes 6 crusts at a time so it's enough for three full pies; plus it freezes beautifully so I can make up a big batch and they last for quite some time. My favorite apple pie is made with Cortland apples, sugar, cinnamon, nutmeg, flour and butter. The apples cook up perfectly and I find that it has just the right texture and taste. Though, I rarely have a pie that looks beautiful at the end it sure does taste exceptionally good! But now onto the crust! Mix flour, sugar, and salt with a fork. Add shortening and mix until crumbly. I usually use my stand mixer with the paddle. Beat egg, water, and vinegar gently with a fork and then add to dry ingredients and stir. It will start to clump together. Divide dough into 6 portions, shape into balls and then refrigerate for 1/2 an hour before using. I often wrap the balls in plastic wrap and then place all 6 inside a gallon size freezer bag. Then I store in the freezer. I only have 5 dough balls because I dropped one large handful on the floor! Once I had my pie crusts all made and my dough had chilled sufficiently, I turned to making my pies. I often make 3-4 at a time and freeze them for the holidays. I first start by rolling out one of the pie crusts using a pie mat, flour and a rolling pin. My boys take turns peeling all of the apples and we find our apple peeler from Pampered Chef works the best because it also slices the apples for us. Otherwise we'd be sure to slice them nice and thin. Once we have 6 cups in a large glass bowl we mix in the sugar, flour, salt, cinnamon, and nutmeg. We pile all of the apples into the pie pan (and often have to press down to fill in any holes). We dice the 2 tablespoons of butter into small chunks and dot the top of the apples with the butter. I then roll out the second pie crust and place it over the top of the pie rolling up the edges and pinching them together. I prick the pie crust with a fork for venting and cover just the edges of the pie with tin foil. I set the pie pan on a baking sheet in case the pie bubbles over or leaks. Then I bake the pie at 425 for 30 minutes. I remove the foil from the edges of the pie and then bake for an additional 15 minutes until the crust is a night light golden brown all over. We let it cool and then we always cut one up and enjoy it with some nice cold, ice cream! 1. Mix flour, sugar and salt together then add shortening. Mix until crumbly. 2. Beat egg, water and vinegar with fork. Add to dry ingredients and mix until crust forms a ball. 3. Divide dough into 6 portions, wrap and chill for 1/2 hour. 1. Peel and slice 6 cups of apples. 2. Mix all dry ingredients together and combine with apples. 3. Roll out pie crust and place in bottom of a 9" pie pan. 4. Pour apple mixture into prepared pan. Cut up butter into chunks and place chunks on top of apples. 5. Top pie with another layer of crust. Pinch edges together and prick with fork. 6. Cover edges of pie with foil and place on cookie sheet. Bake at 425 for 30 minutes. Remove foil and bake an additional 15 minutes until the crust is a uniform light brown color. 7. Remove from oven and let cool 30 minutes before serving. Your apple pie looks so delicious! I love that your boys are helping you cook! Thank you; the boys often help out with cooking and baking. My middle son loves to help make pies; yet he doesn't eat them. It's pretty funny but I love his help. I'm scared of pastry so I am super impressed! I have some apples all ready prepared in the freezer so I might just give it a go! I do have to admit that rolling out the crust and getting it into the pan are my least favorite parts about making pie. I recently saw a blog where they used a small, hand-held roller and rolled the pie crust out right in the pan! I might have to try that next year for the bottom layer. But the homemade crust does taste so much better than the store bought ones I used to use before I got my mom's recipe. It is one of those desserts that make me think "mmmm fall!" 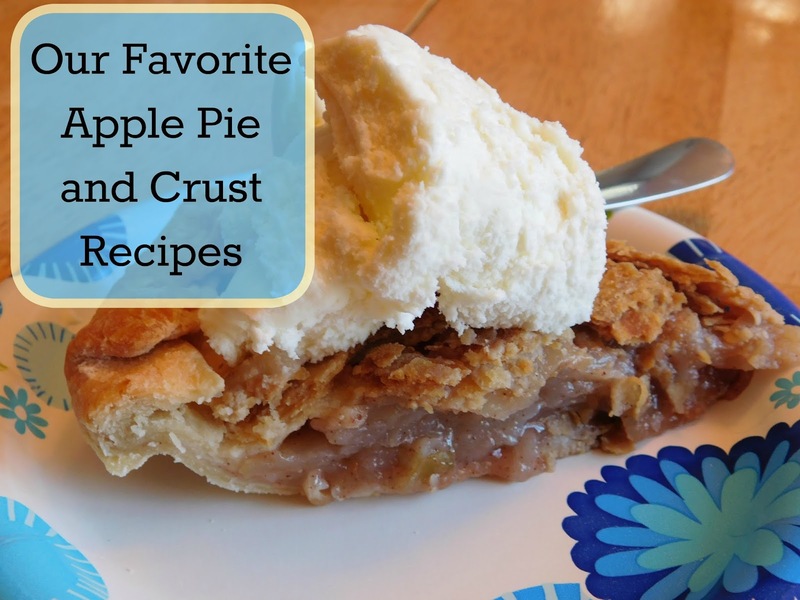 I've never made apple pie before, but this recipe looks so simple and delicious. Thanks for sharing! I make my pies with a regular short crust pastry recipe. I find the flaky pastry very interesting. I'm going to give this a try tomorrow may be. I will let you know! Good luck if you do. I hope you like it. Yum! You are absolutely right that hot apple pie needs a scoop of vanilla ice cream. And I picked up a good baking tip here, too. I always try to cover the edges with foil when they start looking too brown...difficult when the pie is hot. How simple to cover them FIRST. Much easier to remove foil when things are hot than trying to apply it! Thanks! LOL! Yep, much easier to cover the pie before baking. The foil just about wants to fall off anyway so removing it is a piece of cake... even when it's hot. This sounds divine, and I'm always up for trying different crust recipes - I have not perfected my own!